Goods worth several lakhs of rupees were gutted in a fire that broke out at a hosiery unit on the Noorwala road here last night. The health department has implemented the Right to Service Act from August 29. Quirky MC using debris to fill up road cave-in crater! Although the Right to Service Act has been implemented in the health department on August 29, the people who visited to collect death and birth certificates seemed to be unaware it. Some said that it was related to social activist Anna Hazaare, while others thought that they had been given extra time to collect their certificates, as they belonged to a different district. Strange are the ways civic employees function. Three “farewell parties” were recently organized at the municipal corporation’s zonal offices during work hours, much to the annoyance of harassed visitors who were kept waiting to get their work completed. The Greater Ludhiana Area Development Authority (GLADA) demolished structures and internal development projects like roads, water supply lines and sewers in three unauthorised colonies on the Sahnewal-Dehlon Road in an operation which lasted till late last evening. After a truck of the Ludhiana Municipal Corporation (MC) hit a transformer of Punjab State Power Corporation Limited (PSPCL), PSPCL officials submitted a written police complaint against driver of the MC truck for rash driving and damaging government property. Having put Rs 38.84 crore in its kitty from six auctions of its residential plots and commercial properties from November 2010 onwards when the incumbent chairman Madan Mohan Vyas assumed office, the Ludhiana Improvement Trust (LIT) has chalked out ambitious plans to speed up the development works in its existing and proposed colonies involving an overall expenditure of Rs 32.69 core till the end of this financial year. 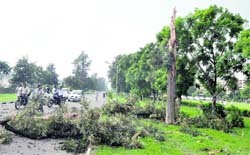 A person had a miraculous escape when lightning fell on a tree inside the Punjab Agricultural University (PAU) campus this morning. The employee, whose identity could not be established, was going somewhere on a motorcycle when the incident took place. 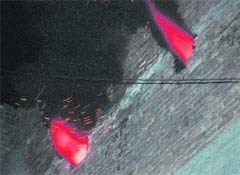 As lightning fell on the tree, there was a big bang, which was heard at a long distance and the tree got badly damaged. An inter-house singing competition was held at Saint Mahapragya Public School, Raikot Road, Jagraon, yesterday. Students from classes III to X took part in the competition. With a series of akhand paths, the 68th death anniversary of Baba Nand Singh Ji, founder of Nanaksar sect, came to an end at the Gurdwara Nanaksar Sahib, some five kilometers from Jagraon, yesterday. The fire department, which should be the most advanced and up-to-date department of the city, is sadly one of the neglected departments of the Ludhiana Municipal Corporation (MC). For a city having a population of 16,13,878, there are just 65 employees with the fire department, which includes drivers. Besides, the employees don’t even have masks to cover their faces, leave aside any other safety equipment. 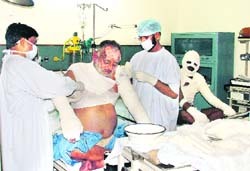 The family members of two firemen, Pawan Kumar, 33, and Rajesh Kumar, 44, have held the public responsible for the severe burn injuries caused to the latter. According to them had people not created panic both men could have avoided being critically hurt. In the absence of proper fire safety measures, incidents of fire continue to take place at factories and hosiery units. 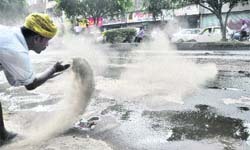 Barring a few big industrial houses, a majority of hosiery owners in the city have failed to install fire-fighting equipment on their premises, putting the lives of their workers at risk. 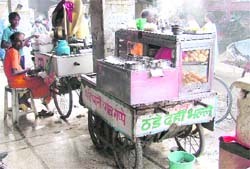 The central government has issued instructions to all state government to issue licenses under the Food Safety & Standards Act, 2006 to all street food vendors with an annual income of over 12 lakh and provide registration cards to those earning less. The aim behind the measure is to ensure sale of hygienic and good quality food items. But as to which official department will implement the directive has yet to be decided. “There’s no doubt whatsoever we’ll continue to be vulnerable to serious injuries in incidents like the one on Monday night in which two firemen suffered critical burns, as neither the municipal corporation nor the state government is concerned about our well being. Though we venture into the jaws of death almost every day we aren’t even provided protective masks to cover our faces, leave aside other safety equipment,” said a firefighter. The city police claims to have arrested a gang of robbers, who were planning to commit a major crime in the city. ADCP Satvir Singh Atwal said that a case under sections 399 and 402 had been registered against the accused. Prabhjot Singh, who runs a confectionary shop at Gurdev Nagar, has been making rounds of the Police Division Number 5, here to get a complaint lodged in a chain snatching incident but the police so far has not taken any action. Court of Additional Sessions Judge Sunil Arora has sentenced Gurmail Singh, alias Geli, of Rajoana village to rigorous life imprisonment for murdering Sukhdev Singh.